Absolutely loved this and loved how fast it was to make. You can substitute boneless skinless chicken breasts or thighs for the pork. Plus you can use the leftover Asian Toasted Sesame Dressing for Firecracker Chicken Stir-Fry. ** I used an asparagus stir-fry mix. Next time I’ll just slice up pepper and onions. HEAT large skillet sprayed with cooking spray on medium-high heat. Add meat; stir-fry 5 min. or until lightly browned. 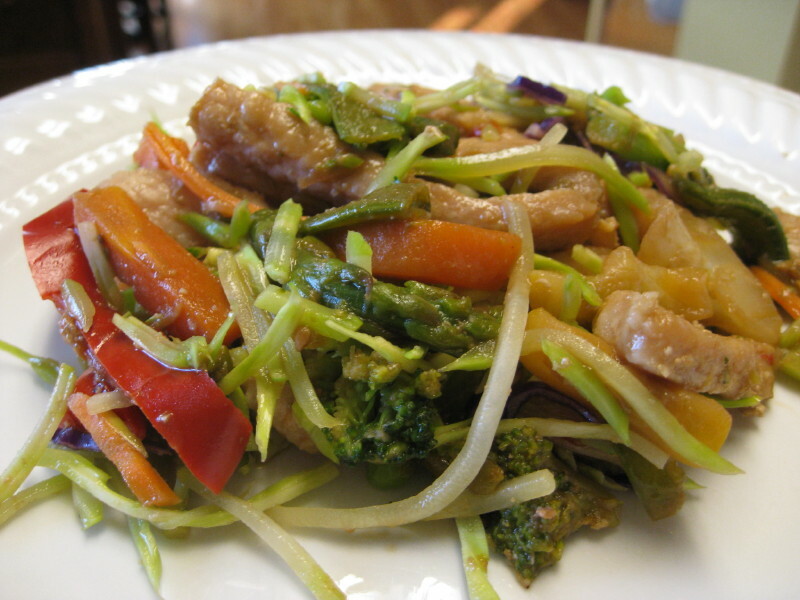 ADD stir-fry vegetables; stir-fry 5 min. or until heated through. Stir in dressing, soy sauce and garlic powder; cook on medium heat 2 min. or until heated through, stirring occasionally. Remove from heat. I’ve tried those before and they are not bad, but not as good as I thought they would be.